Did you ever wonder what is responsible for the spectacular displays of colorful foliage that many look forward to seeing every autumn? Would it surprise you to learn that the plant pigments that color seeds, flowers, fruits, vegetables, and leaves are actually known as flavonoids? Naturally present in fruits and vegetables, as well as red wine, tea and chocolate, these phytochemicals do more than provide color. They are known to have strong antioxidant and anti-inflammatory properties, as well as a wide a variety of health supportive and disease preventive benefits. A well-balanced diet, rich in a variety of colorful fruits and vegetables, is associated with reduced risks of cancer, cardiovascular disease, stroke and neurodegenerative disease. Similar to other antioxidants, flavonoids reduce free radical damage. In addition, some have anti-inflammatory, antihistamine, antimicrobial, anticancer and memory and mood enhancing properties. Plants synthesize flavonoids as a defensive strategy in direct response to environmental stresses, such as ultraviolet radiation, draught, pathogen infestation, and carbon dioxide levels. 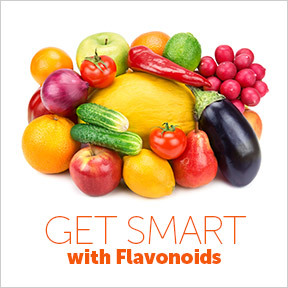 Flavonoids are categorized by group and subgroups, each with their own metabolic functions. For example, flavones, found largely in herbs and hot peppers, are associated with overall antioxidant benefits. Anthocyanidins, found in red, purple and blue fruits and vegetables, are associated with heart health, free radical protection and diabetes prevention. Flavanones, found abundantly in citrus fruits, are associated with cardiovascular health, relaxation and overall antioxidant and anti-inflammatory activity. Isoflavones or phytoestrogens, highly concentrated in soy, soy products, and legumes, may be beneficial in lowering the risk of hormonal cancers, including breast, endometrial and prostate cancers. Flavanols, widely known as catechins, are associated with cardiovascular and neurological health, as well as lowered cholesterol levels. Known for a wide range of diverse physiological activities, flavonols are a widely distributed and well-known subgroup of flavonoids that include kaempferol and quercetin. Kaempferol is naturally present in foods such as apples, onions, grapes and red wine. Its strong antioxidant properties help to prevent oxidative damage to cells, lipids and DNA. Studies have confirmed that kaempferol acts as a chemopreventive agent, prohibiting the formation of cancer cells. It also plays a role in preventing atherosclerotic plaque formation. Together, kaempferol and quercetin appear to act synergistically in reducing cancer cell proliferation. Typically found in red and orange fruits and vegetables, quercetin is considered a very powerful antioxidant, anti-inflammatory, antihistamine and pain reducer. A number of studies have shown that quercetin is cardio-protective and may help to reduce LDL cholesterol and reduce the amount of plaque in blood vessels. Science has shown that antioxidants protect against and may even help reverse normal age-related cognitive decline. As the body’s largest consumer of oxygen, the brain is particularly subject to free radical attacks. Cumulative damage from free radicals is implicated in memory decline, slowing of body movements, and symptoms of depression, including fatigue, irritability and mood disturbances. A study led by Columbia University Medical Center scientists showed that one component of age-related memory decline is caused by changes in a specific region of the brain, and that this particular memory decline could be improved by dietary intervention. Prior animal studies had shown that flavanols extracted from cocoa beans improved neuronal connections. Participants who consumed a high-flavanol diet, as well as a proprietary- processed high-flavanol cocoa drink, for three months had noticeable improvements on memory tests, averaging the memory of a typical 30- or 40-year old. It’s important to note that the cocoa used in the study is not the same as found in your average chocolate bar. Most methods of cocoa processing remove many of the antioxidant properties and bioavailability of the beneficial flavanols found in the raw beans. To attain optimal health benefits from cocoa, avoid products with high sugar content, as well as products processed with alkali, which can damage flavonoids. High quality dark chocolate is rich in flavanols, as well as healthy fats, iron, and magnesium. Chocolate that contains 70% or more cacao will provide a higher percentage of antioxidant flavanols. A diet rich in colorful plant foods is certain to provide an array of antioxidants. Fortunately for chocolate lovers on a quest for overall wellness, there’s room for an ounce or two of healthy dark chocolate indulgence daily. FlavonALL® by Douglas Laboratories®: This dietary complex provides a broad spectrum of beneficial antioxidant flavonoids in nutritionally meaningful amounts. Ingredients include green tea extract, Pycnogenol® pine bark extract, red grape seed extract and a citrus bioflavonoid complex. Soy free, vegan formulation. Ester-C® Flavonoids by Pure Encapsulations®: This synergistic dietary supplement supplies natural, non-acidic, water-soluble and highly bioavailable vitamin C, quercetin and various flavonoid compounds in support of antioxidant, immune, and vascular integrity support. Gluten and soy free, Non-GMO vegetarian formulation. Super Flavonoids by Genestra™: This product supplies a broad range of bioflavonoids and botanicals for antioxidant and wellness support. Gluten, soy, dairy, wheat, sugar, preservative and artificial ingredient free, vegan formulation. Pycnogenol® Complex by Source Naturals®: This potent antioxidant complex supplies ten plant-derived antioxidants to provide natural and power-packed health support. ProWhey with Organic Raw Chocolate by Vital Nutrients: This minimally processed whey protein concentrate is produced in New Zealand from milk provided by cows grazing on chemical and pesticide free natural grass pastures. The fair trade organic raw cacao provides a natural source of antioxidants, iron, magnesium and fiber. Independently tested for authenticity, stability, protein potency, heavy metals, bacteria and residues. This entry was posted in Home and tagged Ester-C & Flavonoids by Pure Encapsulations, FlavonALL® by Douglas Laboratories, Get Smart with Flavonoids, ProWhey with Organic Raw Chocolate by Vital Nutrients, Pycnogenol® Complex by Source Naturals, Super Flavonoids by Genestra. Bookmark the permalink.